Artificial reefs... The Use of Electrical Current to Enhance Calcium Carbonate Formation - 08/02/07 Hello WWM! <Hello Marc! Mich here!> As always thank you for this wonderful website! <As always, thank you for the kind words.> Tonight, I have a question regarding artificial reefs. I saw a program on TV this week about the Palms Islands off the coast of Dubai (United Arab Emirates). I fear that this project might very well doom a huge part of the marine biodiversity in this area, but that is not why I am writing. 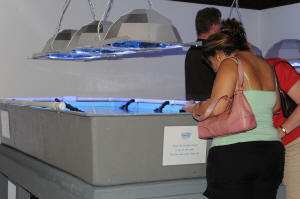 In this program they spoke of their intentions on building a huge artificial reef around some of the islands. They were using an interesting technique involving a metallic structure in which an electric current is sent (I don't remember the intensity of this electric current). 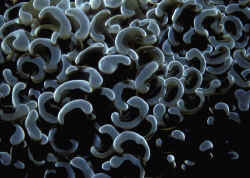 This technique was supposed to attract "corals" to the metallic structure, and thus, building a new reef. <Yes have heard of this. More here: http://news.bbc.co.uk/2/hi/technology/3717168.stm http://www.globalcoral.org/Electric%20Reefs.htm http://www.globalcoral.org/index.html> What they showed resembled a lot calcium carbonate (they called it "live corals", but I doubt there was any living corals on these). <No, the corals are living.> I tried finding more info on the web regarding this unique technique, but haven't found any. <It's out there, you just have to look.> What do you think about this technique and do you have more info on it, <It works. See links above> specially regarding how it could "create" coral skeletons (my guess would be that the electrical current enhances calcium carbonate precipitation)? <Enhances Calcium Carbonate formation. Providing some of the skeletal material, allows the coral polyps to focus its energy on tissue generation.> Thank you for your time, <Welcome. Mich> Marc.